Approximately 10 cherry blossoms will be removed and eventually replaced so the NFL draft stage can be built. This update comes after thousands of people signed a petition demanding 21 trees not be uprooted from downtown Nashville. 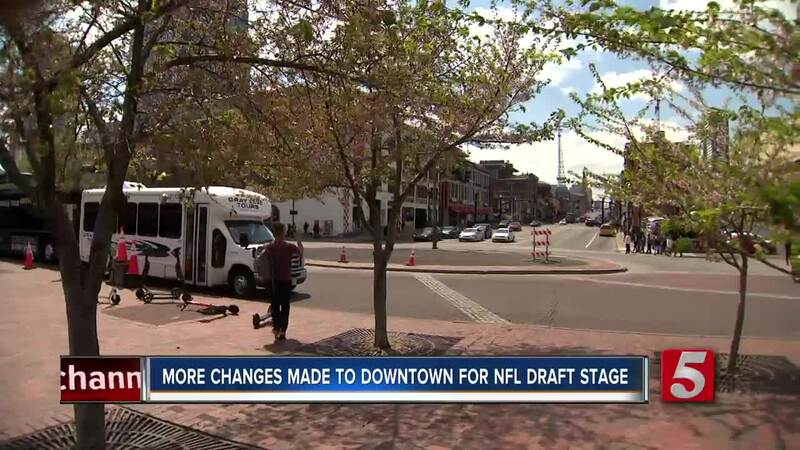 NASHVILLE, Tenn. (WTVF) — Approximately 10 cherry trees will be removed and eventually replaced so an NFL draft stage can be built. This update comes after thousands of people signed a petition demanding 21 trees not be uprooted from downtown Nashville. The CEO of the Nashville Convention and Visitors Corps said his intention was to make the Riverfront area nicer by replacing old trees with new ones. Butch Spyridon said, "The NFL and our organization, heard the public outcry loud and clear... Wrong as we were, when we looked at those trees, they were varying in size, varying in age, we thought we could create some uniformity." 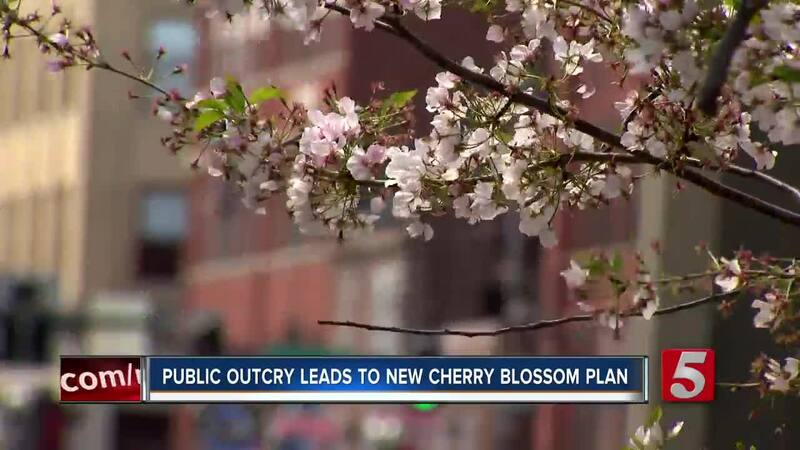 Nashville Tree Foundation Executive Director Carolyn Sorenson fears the cherry blossoms won't survive being transplanted. "Any tree removal of this sort for a 48 hour event is very shortsighted," Sorenson said. "We hope to work positively in the future with other groups towards more transparency so we won't be faced with this again." Originally, the city said 21 trees would be removed, but after the uproar on social media, some of the trees along 1st Avenue North will stay, but the 10 or so trees closest to the river will have to move. Spyridon said, "Cherry trees have a relatively short life, 15 to 20 years, these trees are replaced regularly which is why our thought of replacing the trees seemed logical although admittedly wrong." A Tennessee master gardener who works at the Gardens of Babylon said if it's done right, the trees will survive. Neil Anderson said, "People can be optimistic, they will probably go into shock, they will probably defoliate or lose their leaves, but I doubt that they'll all die, we may lose 1 or 2 of the 10 that they're transplanting, but I would imagine that most of them would survive." If possible, they will bring these trees back to downtown, but only if a horticulturist thinks it's possible. "Rest assured we're going to get this right and we're going to make Nashville proud," said Spyridon. As an act of good faith, the Nashville Visitors Corps and NFL will plant 200 additional cherry blossoms in the city. "It's a bit disheartening that people would think we don't care… we do. To be able to stand here and tell you all, that we got it wrong, we apologize, and we're going to get it right is particularly important to me and this organization," said Spyridon. It's unclear where the cherry blossoms will be re-planted. On Monday they're meeting with horticulturists to develop a plan. City officials were also adamant that they didn't take money from the NFL to remove the trees. On Sunday Mayor David Briley told the media he was disappointed with how the situation was handled. The cherry trees aren't the only things being removed. the Hard Rock Cafe Guitar, street lights, railing, street signs all have to go. According to the Nashvlle Convention and Visitors Corps, the NFL or the Visitors Corps is paying for everything. The visitors corps has raised over $3 million for the event. The NFL draft brought in more than $125 million for the city of Dallas last year.